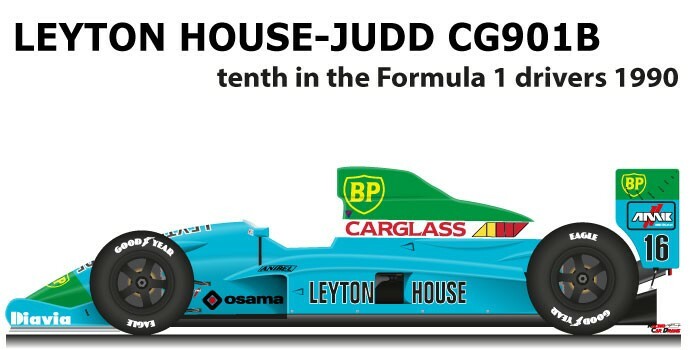 The Leyton House – Judd CG901B n.16 is a car that participated in the Formula 1 World Championship in 1990. With the entry of the Leyton House in March Engineering the team tried to recover, entrusting the project to a young English engineer Adrian Newey. The CG901B was an evolution of the previous year and to find more speed due to a less powerful engine, Newey found extreme aerodynamic solutions that caused difficulties for the pilots. Ivan Capelli with Leyton House – Judd CG901B n.16 finished tenth in the Formula 1 World Championship in 1990. During the season the Italian driver finished in points only in the French Grand Prix where he finished second behind the Ferrari 641 n.1 of Alain Prost that passed the celestial car only three laps from the end. With the point won by Mauricio Gugelmin in Belgium, La Leyton House finished the world constructors in seventh place.